I decide to do some shopping at a department store after work, despite my feet hurting in my high heels. The video starts with me walking towards the store, and then the camera follows me around as I browse the shop. 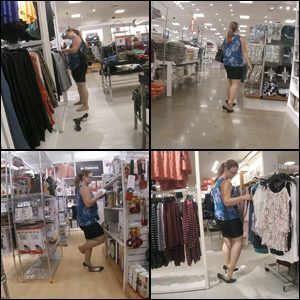 I do lots of shoe dipping, slipping out of both shoes at times, walking some with my shoes off, accidentally getting the shoe turned around backwards before trying to slide it back on, rubbing my pantyhose-clad foot up the back of my leg, and so much more! Almost 17 minutes of shoe dipping action!